The events of 1948, with the establishment of the State of Israel and the Nakba – as Palestinians call it -, not only marked the destruction of hundreds of populated villages and the mass displacement of hundreds of thousands of people, it also resulted in a still-ongoing process of stripping Palestinians of their cultural and historical heritage. On the politics of information in Israel-Palestine. The question of the archive occurred to me during a visit to Y’s house2. In the midst of a research project looking for the earliest photos of Palestine, I found myself in the home of one of Israel’s most prominent Jewish private collectors. Now an old man, his house is a museum- a life’s worth collection of Zionist memorabilia. The walls lined with dusty wooden shelves from floor to ceiling packed with books, photo albums and artwork. Sitting at the dining room table where magnifying glasses, rulers, and pencils are arranged compulsively in metal containers, Y is not sure where he put the album I asked to see and after pondering for a while he concluded that the item is placed on a shelf too high up for him to reach. As he took out a different collection of original black and white prints, I began to wonder how were these photographs acquired? Why are they not deposited in a public archives? What could be gained if access to this material was not so limited and arbitrary? Who is not able to access this material? While unapproachable archival material is not a unique problem to Israel-Palestine understanding the politics of information within this context can provide a better understanding of the gaps between Israeli and Palestinian historiographies. In his book Archive Fever, the French philosopher Jacques Derrida refers to the domestication of primary sources in archives as a form of house arrest. This particular metaphor is apt for the question of archives and the information regime in Israel-Palestine. In this article I wish to explore the obstacles of conducting research in and about the history of modern Palestine-Israel through the lens of primary sources, those that exist and those that are absent. Like my experience at Y’s house, Israeli scholars today have direct access — some would say a monopoly–over primary sources that pertain to the modern history of Palestine and Israel. Among the sources under ‘arrest’ are books, family documents, court documents, land deeds, diaries, photographs and other artifacts. The events of 1948, with the establishment of the State of Israel and the Nakba, mark the mass displacement of Palestinians, the destruction of hundreds of populated villages and the dispersion of the Palestinian population into exile. Furthermore, the Nakba also resulted in a still-ongoing process of stripping Palestinians of their cultural and historical heritage, making it difficult to access lost and stolen property. Through a complex set of laws passed by Israel after the war by Israel, namely the Absentee Property Law and the Custodian of Absentee Property3, several Israeli institutions were physically built on top of, or inside of Palestinian villages. The villages and homes were demolished and/or looted, the content of the homes plundered, nationalized and/or re-housed in the newly established Hebrew institutions–universities, museums, libraries and archives. To finalize the erasure and appropriation, limitations on the freedom of movement were put in place to restrict access of Palestinians to these locations. In this way Palestinians have been doubly subjugated, once when written out of history, and second when denied access to the sources necessary for writing their own history. While the AP books represent looted heritage, the Haganah Village Files are an example of sources that originally belonged to Israeli institutions but hold key information about Palestinian history. As noted by Dr. Rona Sela, the village documents are “in some cases the only surviving/most recent testimony of the existence of Palestinian villages, just before they were forcibly emptied of their inhabitants.”6 The files include charts, sketches, drawings, textual surveys, maps, ground photographs, and aerial photographs, all taken by Haganah scouters gathering intelligence about Palestinian villages as early as 1943, five years before the war broke out. Whereas The Village Files that survived “can assist in many areas of research and can fill in blanks in the missing worldview,”7 the question of access still looms: How will Palestinian scholars use them when they are all located in Israeli archives? Since most of the material is not (yet) available digitally, Palestinians without permits, or those living in the diaspora, cannot access the materials and even those who are able to physically access the archives might encounter a long line of questioning and suspicion, specifically in places where one is dependent on the cooperation of staff archivists to access information. Filmmaker Eyal Sivan speaks to another phenomenon in Israeli institutions, particularly those that have information about the Nakba and about land purchasing: “I’ve been to about eight Israeli archives. I saw that many pages were “missing”12. Sivan’s experience echoes with my own; I have noticed catalogued items that were missing from files at the Central Zionist Archives. It is unclear whether these pages that have gone “missing” are actually lost or have been intentionally eliminated. The prevalence of “disappeared” material requires further research. Mapping the sources can be one strategy for overcoming the cliché that history is written by the victors. The conclusion, however, is not that there are no sources to draw on but rather that the complex circumstances of Palestine requires looking at new sources to teach us about the past. Some examples include the study of textiles, floor tiles, agricultural tools, prison letters, village books and more. Additional questions deserving further research include how to ‘liberate’ the sources from their ‘arrest,’ how to determine the rightful owners, how to facilitate the return of property within the greater context of the Right of Return and what are the most effective ways to digitize materials and make them accessible to all. In these arrested histories the notion of the archive gets flipped on its head, as they are no longer just time capsules of the past but rather a gateway into the future. 4 The Great Book Robbery. See also Amit, “Salvage or Plunder?”. 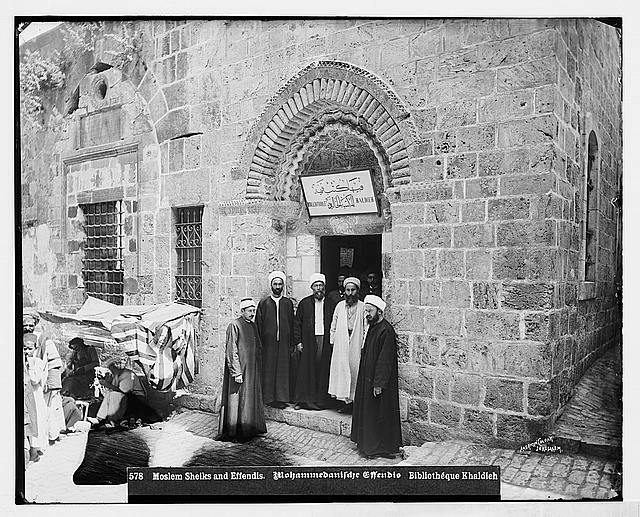 8 El-Hage, “Khalil Raad – Jerusalem Photographer”; Nassar, Photographing Jerusalem. 10 See: Main publication about Photography at the turn of the century: Silver-Brody, Documenters of the Dream; Sela, Chalil Raad, Photographs 1891-1948; Perez, Focus East; Khalidi, Before Their Diaspora; Nassar, Photographing Jerusalem; Nir, The Bible and the Image; Raz, צלמי הארץ; Silver-Brody, Rosenbluth, and (Haifa), From Mirror to Memory.Main Archives: Central Zionist Archives, The Israel Museum, The National Library, Yad Ben-Zvi, Municipal Archives and private collectors. The largest and earliest body of photographic account of life in Palestine is most likely the Library of Congress, which is available online. Additionally, the Institute for Palestine Studies has an impressive collection in Beirut, but relatively small in comparison to the Israeli institutions. See also Arab Image Foundation. 11 Rotbard, White City, Black City. 14 See: Prisoners Museum at Al Quds University, the work of the Institute for Palestine Studies, Riwaq’s work to restore cultural heritage, Librarians at Birzeit University, Wadi Hilweh Information Center in Silwan, the Khalil Sakakini Cultural Center in Ramallah, the work of Zochrot and more. 15 Geschwind et al., Study on the Organisation of Doctoral Programmes in EU Neighboring Countries – Occupied Palestinian Territory.